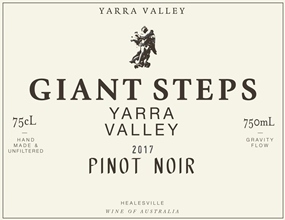 This wine expresses an intricate blend of delicious parcels from Giant Steps’ Tarraford, Applejack, Lusatia Park, Primavera and Sexton vineyards. Powerful, lifted aromas of cherries, blue and red fruits are complemented by underlying savory, gamey characters. Forest floor flavors lead into the medium-bodied palate which is lush, elegant and broad. The supple yet present tannins will support cellaring for at least ten years.